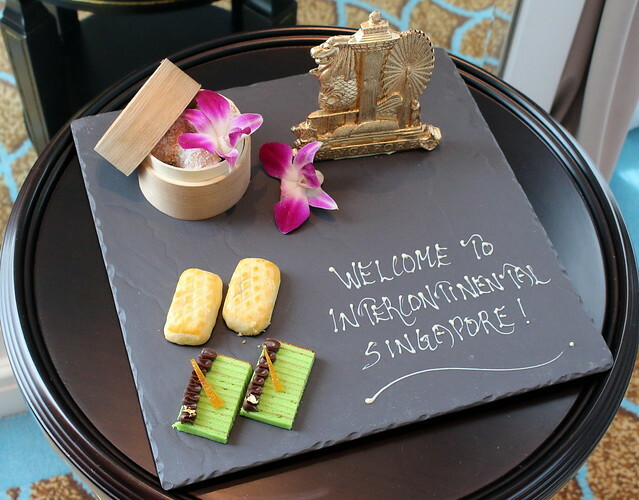 The InterContinental Singapore has always been elegant but it's even more polished now. 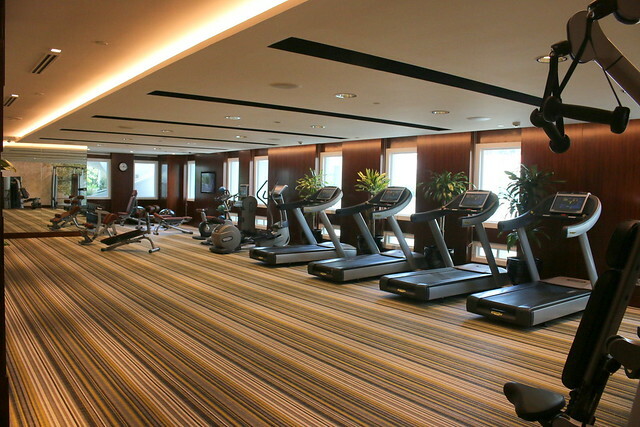 A multi-million dollar renovation in April 2016 refreshed its hotel lobby, tower guestrooms and suites, fitness centre, European dining restaurant as well as The Lobby Lounge. 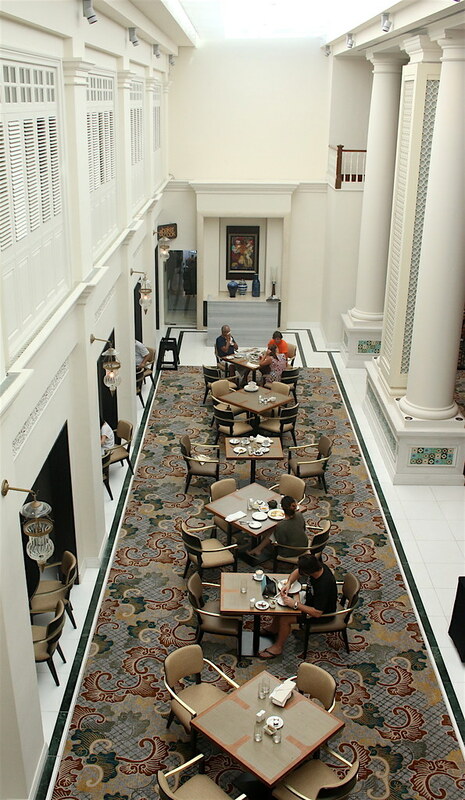 This follows the successful revamp of their Heritage rooms and suites, and Club Lounge (above) in Aug 2011. This landmark hotel was built in 1995 and continues to draw on the rich heritage of the locale. 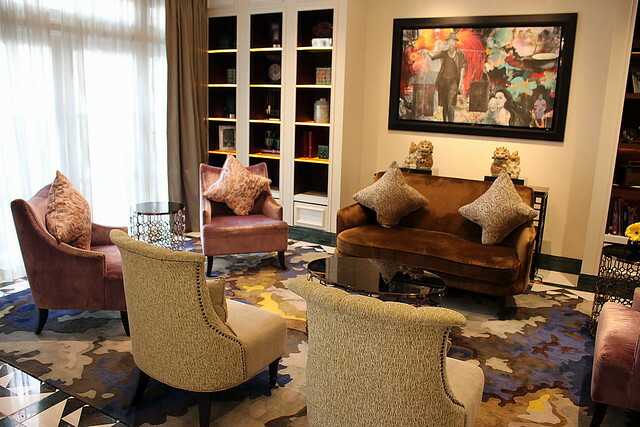 The Concierge Lounge located at the entrance of the hotel lobby is fashioned after the living room of a Peranakan home. Hospitality begins here, the minute you step inside the hotel. 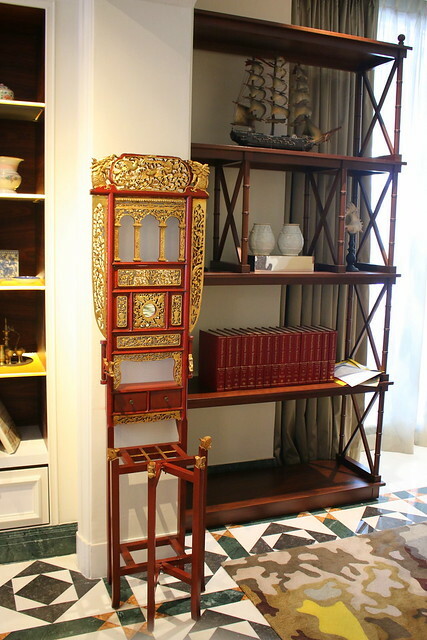 The seating area at the Concierge Lounge is flanked by two shelves displaying items that represent the different cultural elements of the locale. A focal art piece on the central wall similarly captures the mix of local characters from all walks of life, reminiscent of the bustling activities that used to take place along the site where the hotel now stands. Display items include food containers bearing traditional prints of phoenixes and peonies, porcelain pillows which were commonly used in the past as well as a basin stand, typically found in bedrooms of houses with communal bathroom facilities. The sailing ship is also representative of the area being a trader's port. 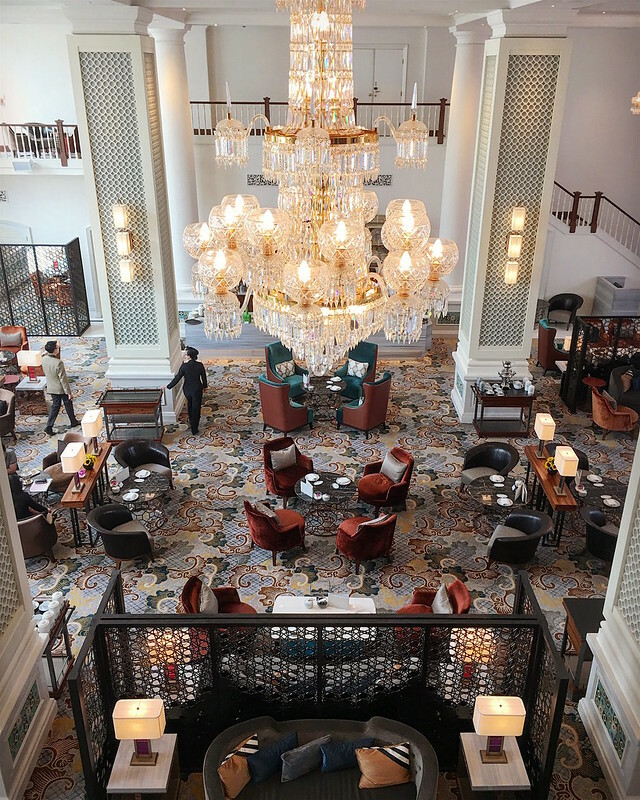 The Lobby Lounge still radiates an ambience of old-world charm. Lofty white-washed colonial pillars, a marble bar, and a grand staircase stand juxtaposed with customised period-pieces of furniture. Bronze metal screens carve out intimate spaces while allowing an open feel with the see-through motifs. Contemporary elements such as lounge chairs upholstered in stylish hues of duck egg blue and a rich palette of rusts and greens on the carpet. 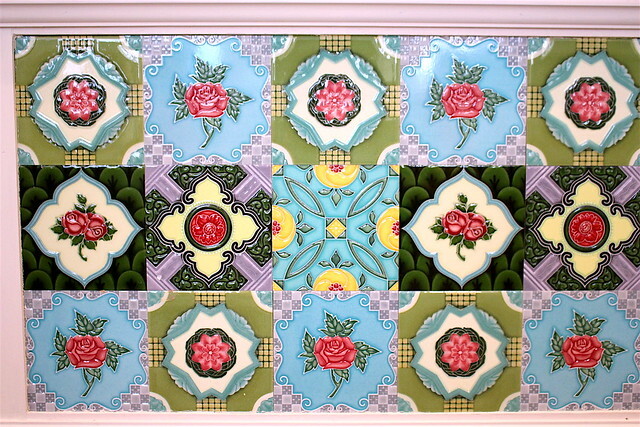 If you look at the bases of the pillars, you'll see 12 different coloured tiles used in traditional Peranakan houses. These are replicated in the tiles of the ceiling too, in laser-cut motifs. 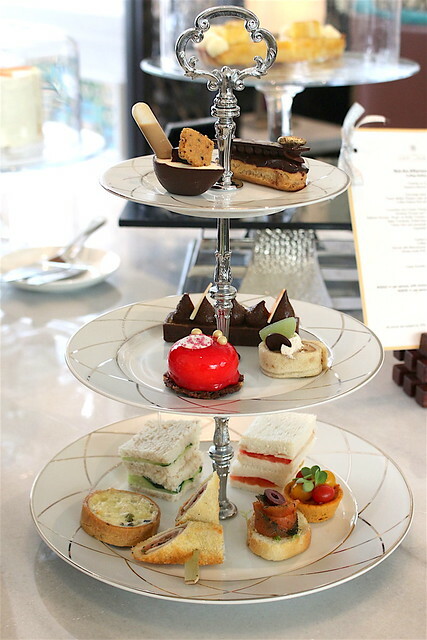 The Lobby Lounge is where you can partake in some three-tier style Afternoon Tea (S$42++). The set comes with scones and TWG tea/coffee. The items are not refillable although they are willing to top up more sandwiches for you. 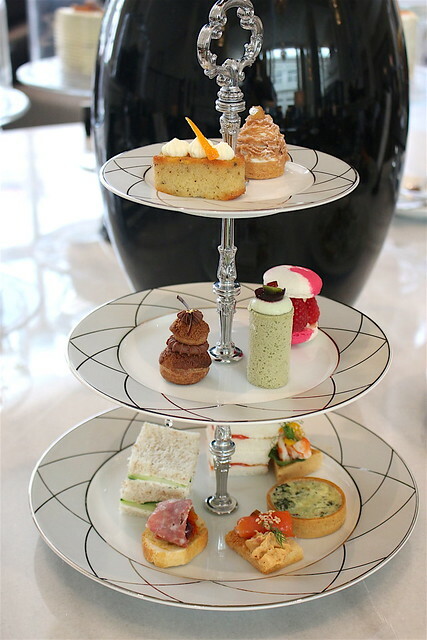 If you're not a tea person, they have an unusual Not-An-Afternoon-Tea (S$42++) which swaps out items for coffee-infused pastries. 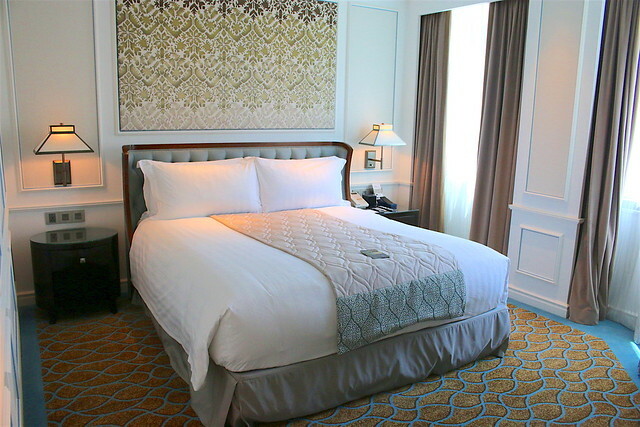 The Deluxe Rooms make up the bulk of the tower guestrooms. These have a decidedly ethnic and colonial feel to the contemporary decor thanks to the heritage-inspired furnishings and little design details. 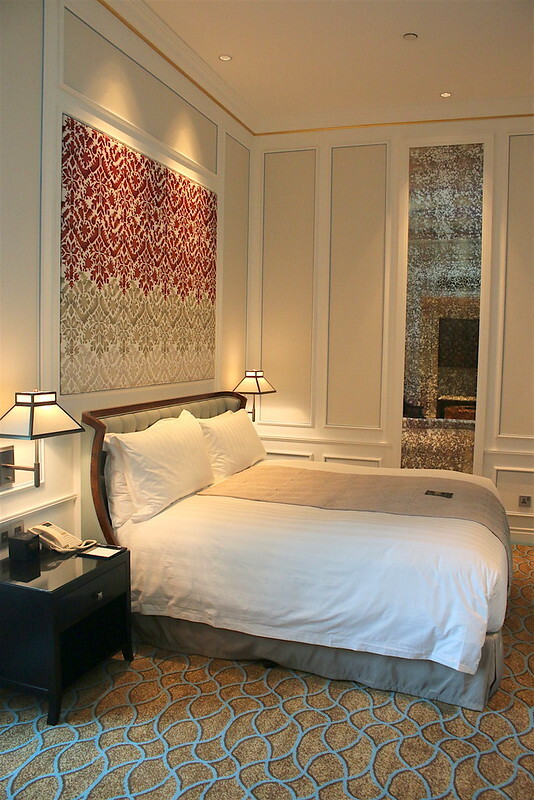 The headboard above the beds are created with a padded silk covering that features a contemporary interpretation of Peranakan tile motifs, produced exclusively by FBEYE International, using a traditional technique of block-printing. Our Deluxe twin room did feel a little small but the two big plush beds were so comfortable, it was worth the space sacrifice. There's still a luxurious feel with silk-threaded wall coverings and panels against white walls, and gold trimmings on the ceiling. We loved the little details like the columns near the bedroom entryway. The aircon vent above it also has a very pretty motif. My girls had an absolute blast. They didn't want to leave the room much. 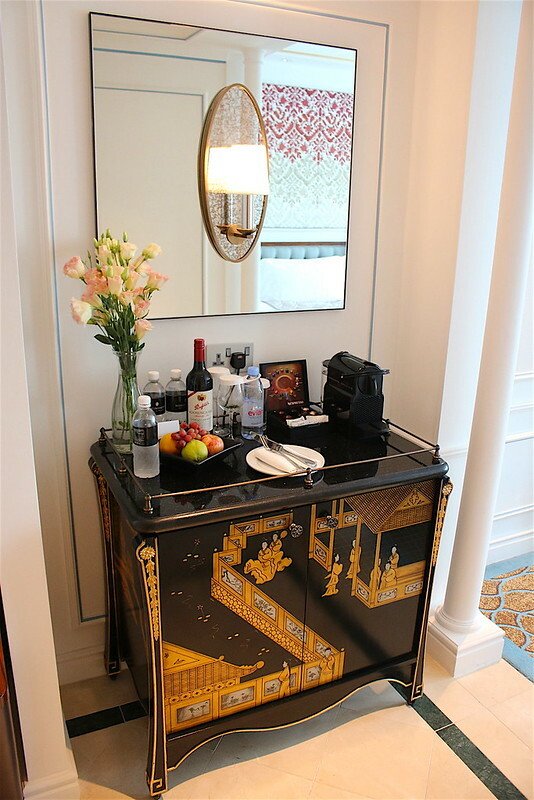 The mini-bar refrigerator is set within a gorgeous cabinet fitted with black lacquered doors made of mahogany veneers and solids, complete with a champagne gold gilt finish. Such oriental charm. 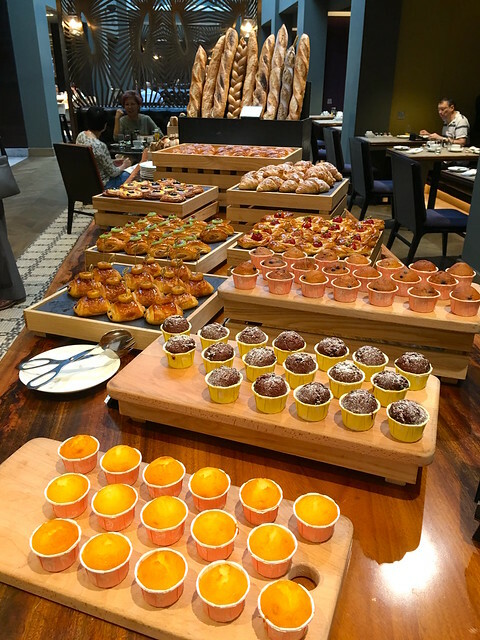 Besides the bowl of fruit at the beverage cabinet, there's a welcome platter with local kuehs (onde onde in the basket, pineapple cakes and kueh lapis) and a gold-dusted chocolate block in the shape of a Merlion-Changi Tower-Singapore Flyer souvenir. 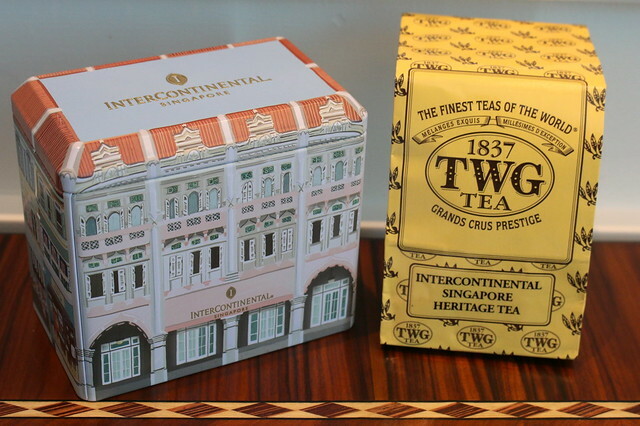 The InterContinental Singapore has its own TWG tea, and a very cute tin caddy in the shape of the shophouse wing. 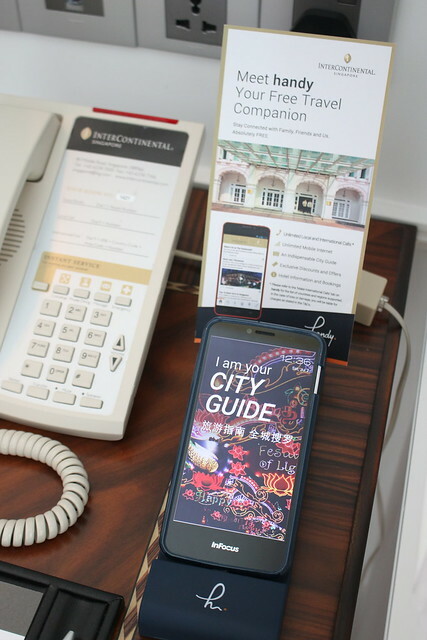 The hotel even provides an InFocus phone with a city guide, unlimited local calls, text and data. Very useful for tourists, I'm sure. 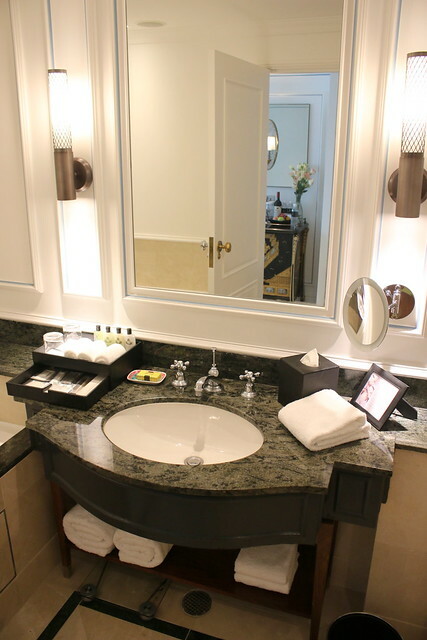 The bathroom is simple and elegant with warm ambient lighting and marble countertops. 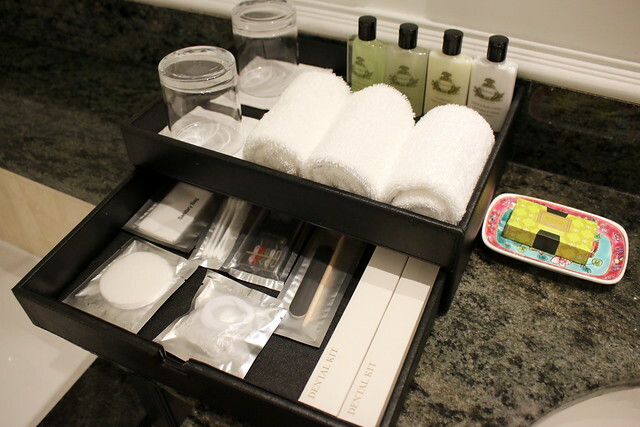 Bathroom amenity kit featuring Lemon Verbena toiletries from Agraria, an American brand of home fragrances. 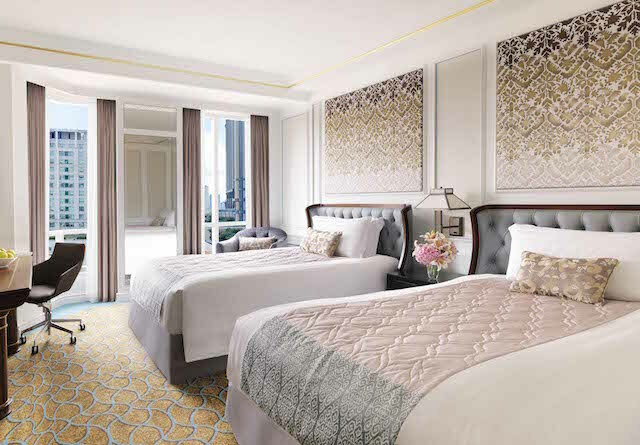 The refreshed heritage-inspired design extends across all 338 guestrooms of the main tower, in room categories including the Club InterContinental Rooms, Business Rooms, Premier suites as well as the Executive, Ambassador and Presidential suites. 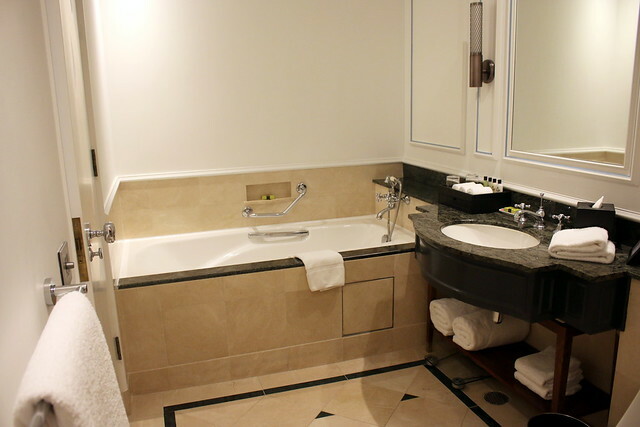 The Presidential Suite was occupied that day, so we couldn't take a peek, but here's a hotel photo. What luxurious furnishings. The huge space takes up pretty much half the floor too. It's yours for S$5,000 a night, give or take. 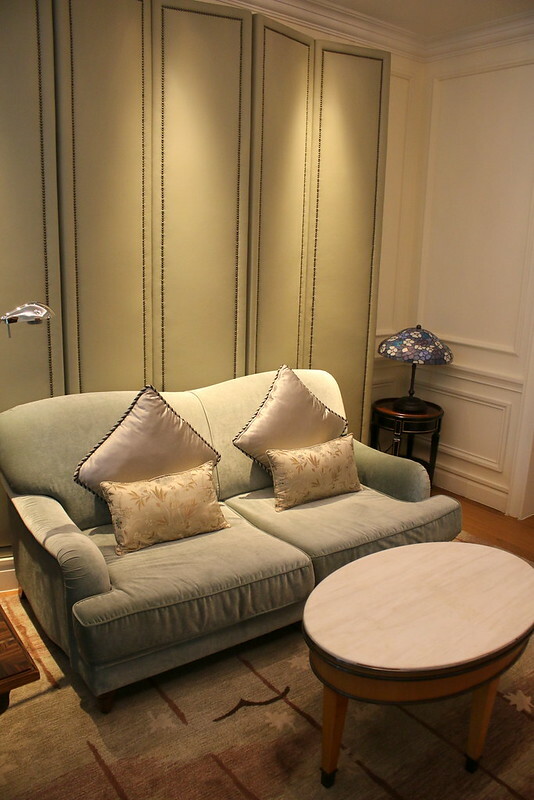 Also beautifully appointed is the Ambassador Suite. It has a spacious living area, formal dining table, office nook, separate bedroom and bath. The ceiling is extra high on this floor, blessing the whole area with calming space. 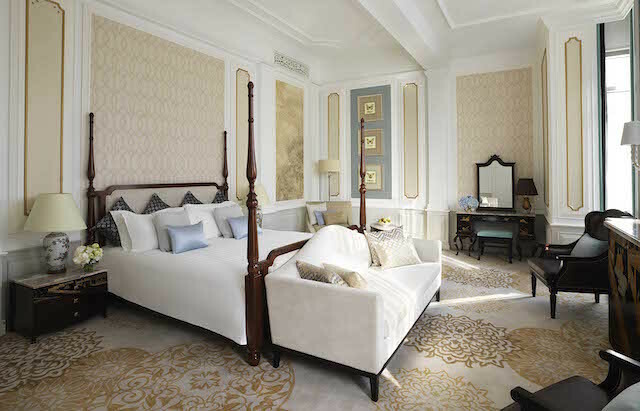 The shades of white, duck egg blue and gold lend a peaceful air to the rooms. The walk-in wardrobe is bigger than my bathroom at home. 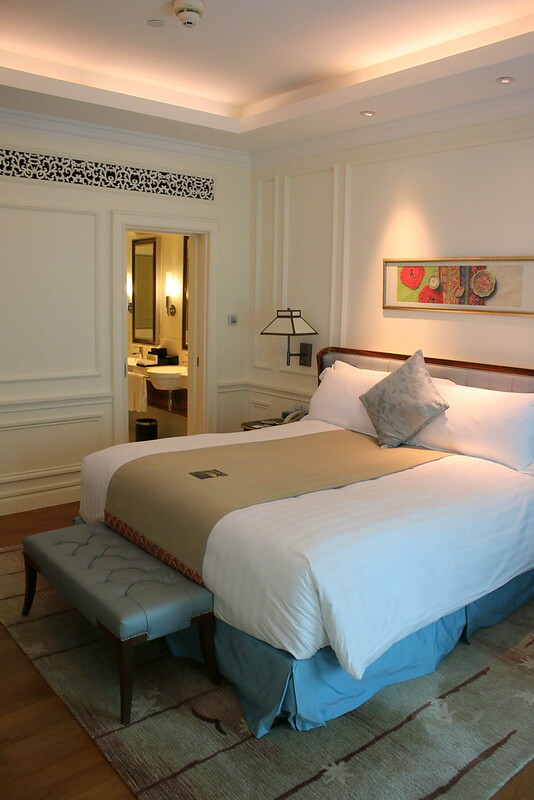 The Heritage Rooms and Suites were formerly known as the Shophouse Rooms and Suites, because they are in the two or three storey shophouse format. I hear these are often booked for weddings. The Heritage Suites carry a residential charm that's quite different from the more contemporary Tower rooms. They are slightly more reflective of Peranakan culture, and each room has a balcony overlooking the Bugis Village air-conditioned streets. In case you're curious, the shophouses have been rebuilt as the original structures were too old. The refurbished Gym looks fabulous! So much free space! Gorgeous machines! There's even a private yoga room at the back. 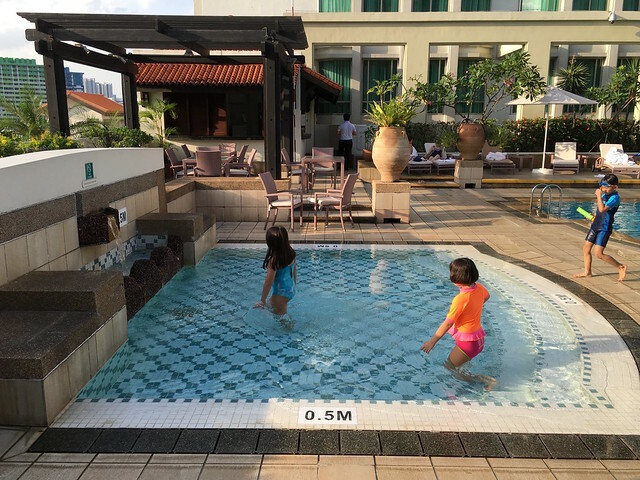 The swimming pool complex is pretty cosy with two small kiddie pools of different depths. I like how the tiles in the pool are slightly reminiscent of Peranakan tiles too. 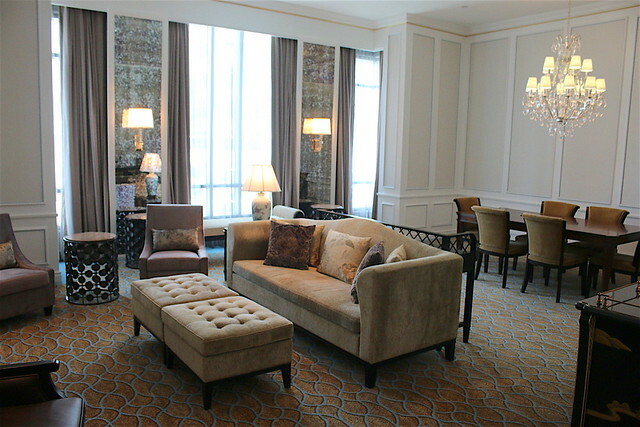 The Club Lounge was renovated in 2011 but it's charming nonetheless. I love the vibrant colours, the ethnic touches, the warm woods and homey rugs over the beautiful hardwood floors. 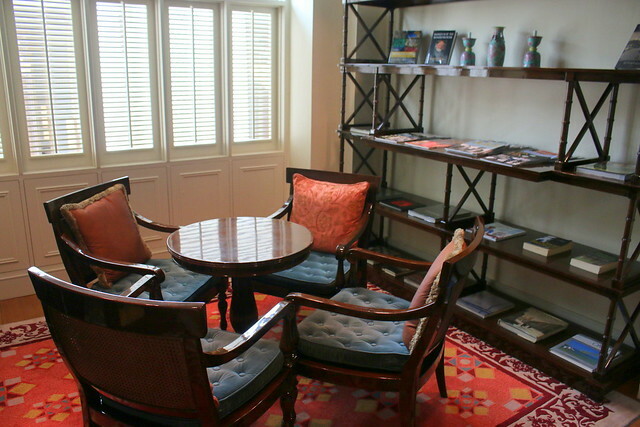 There are private sections for reading or relaxing with friends over a cuppa. 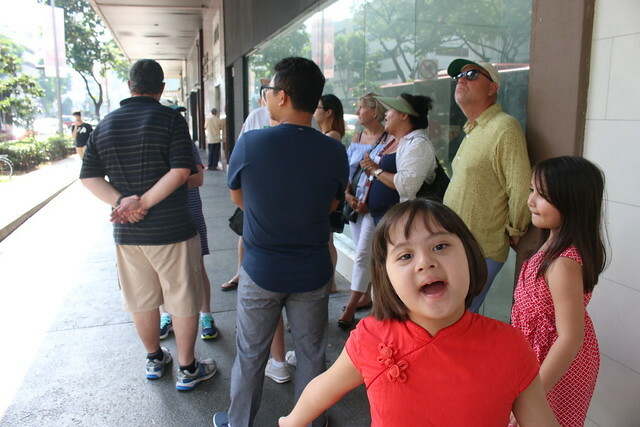 The InterContinental Singapore has a free guided Heritage Trail on the Saturday afternoons – a walking trail curated in partnership with the Singapore Tourist Guide Society, that will take you through areas of interest surrounding the hotel (Rochor, Middle Street, Albert Street, Waterloo Street). 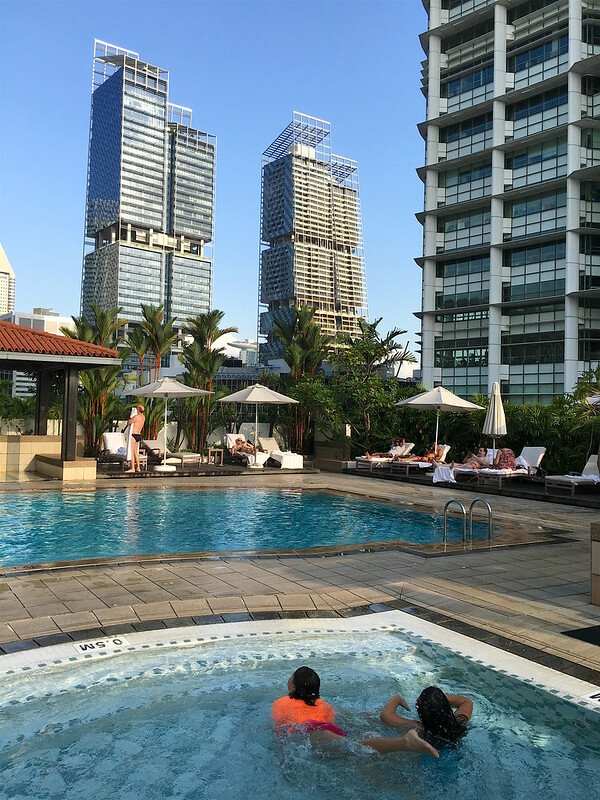 But you don't need a guide to explore the arts and cultural districts of Bugis and Bras Basah. The historical enclaves including Arab Street, Kampong Glam and Little India are within walking distance; whichever way you wander, you are bound to discover something fascinating. Ash & Elm is the completely new incarnation of Olive Tree. It's such a complete departure decor-wise, and I'm happy to see the food is also much better. See my Ash & Elm review earlier. 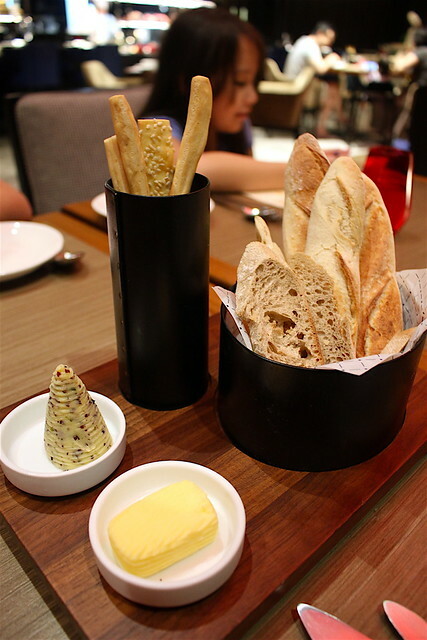 The wood-fired oven churns out perfectly baked breads that go so well with the seaweed butter. 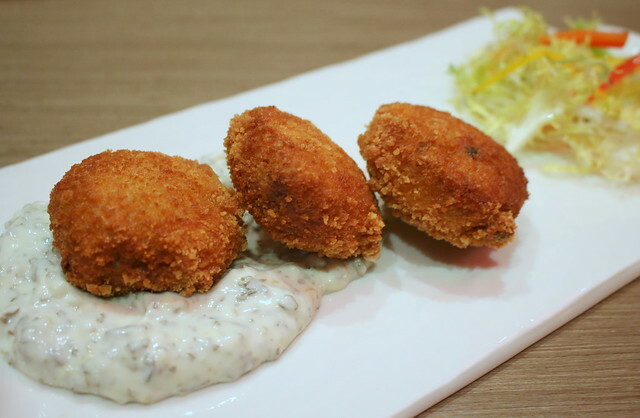 The Crabcakes are pretty decent. I love how Ash & Elm does meat, especially steaks. 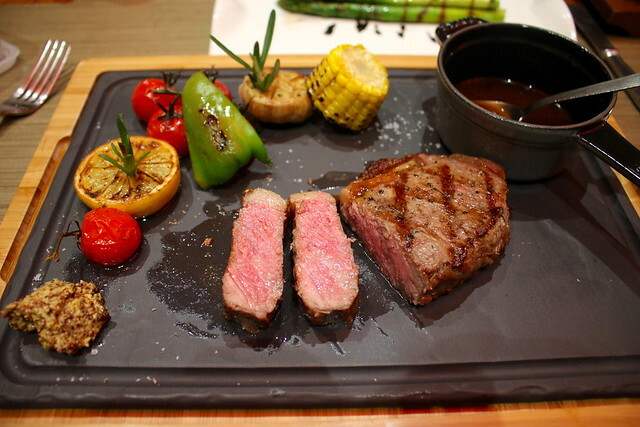 The USDA Prime Striploin is my favourite cut here. 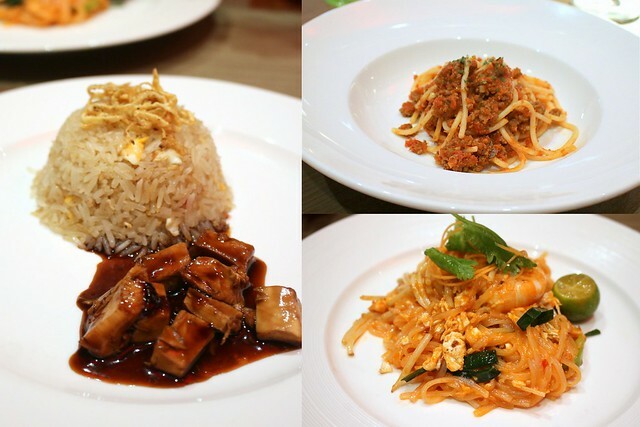 They are kid-friendly too, with dishes designed for children from just S$8, like pad thai, spaghetti and soy sauce chicken with rice. However, portions are fairly small, but probably good for kids aged 4-5. I should have just gotten more adult portions and shared with the girls. 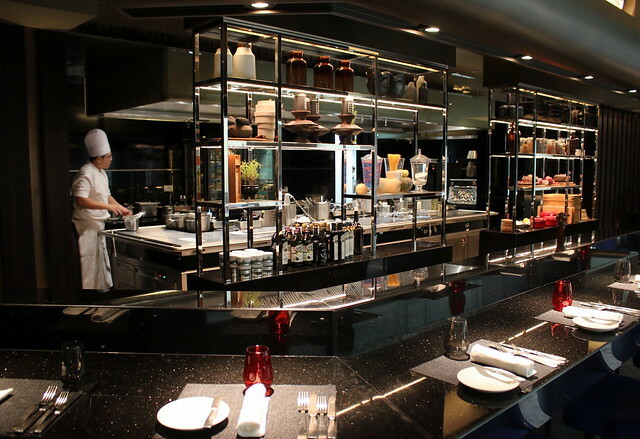 In the evening, Ash & Elm has three culinary theatres: cheese & charcuterie room, wood-fired oven, and open-grill kitchen. 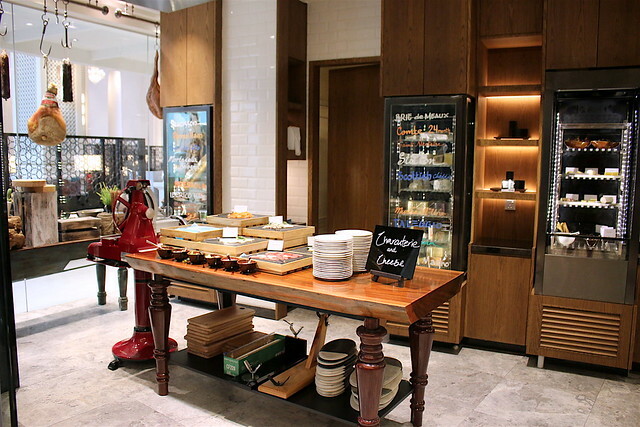 In the day-time, these become open areas and live stations where diners can come in and take their pick of items, or give orders. The buffet breakfast has a decent spread of food. Don't miss the freshly squeezed juices and yoghurt on a side alcove. 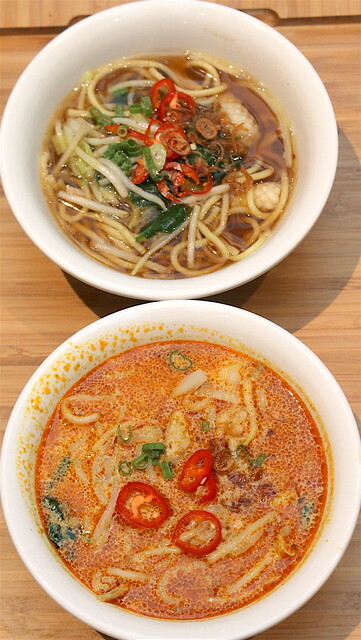 The live noodle station does a clear broth noodle as well as a coconut broth laksa. The live egg station will do eggs however you like. 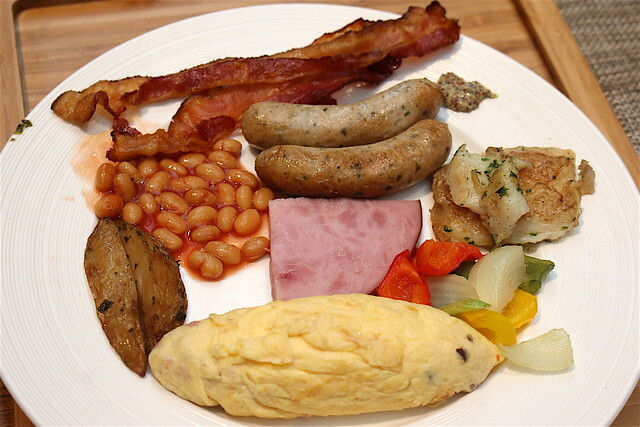 Add bacon, potatoes, sausages, grilled vegetables, baked beans and ham, and you have a full Western breakfast. 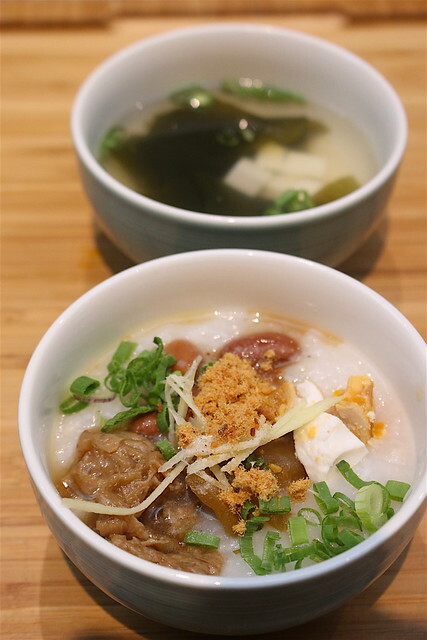 The Asian section also includes Japanese wakame or miso soup and Chinese breakfast porridge. 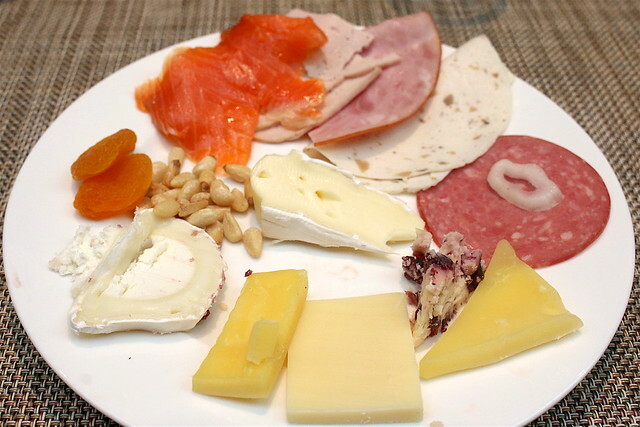 The cheese and charcuterie items for breakfast seem a bit limited (this is the whole selection), but it's probably enough given that there are so many other things to eat. Well, this is my first time staying at the InterContinental. I've always liked the food here (see Man Fu Yuan, Ash & Elm) and staff service is always top-notch. I'm happy to say that the accommodations are just as pleasing, and the experience is truly a welcoming one.